It was two days before Christmas. Little Ted, a one year old Jack Russell Terrier, was happily chasing a stick during breaks in the farm activity of removing the roof from a barn. Bringing the stick back on one occasion he decided to take a shortcut between the machinery lowering the roofing sheets, and the barn. His timing was extremely unfortunate and he was struck by a heavy, fifteen foot long, corrugated sheet as it came down. He cried out and ran under a trailer and his owner was apprehensive of what he would see when he coaxed him out. Surprisingly, a hind leg lameness was the only result. 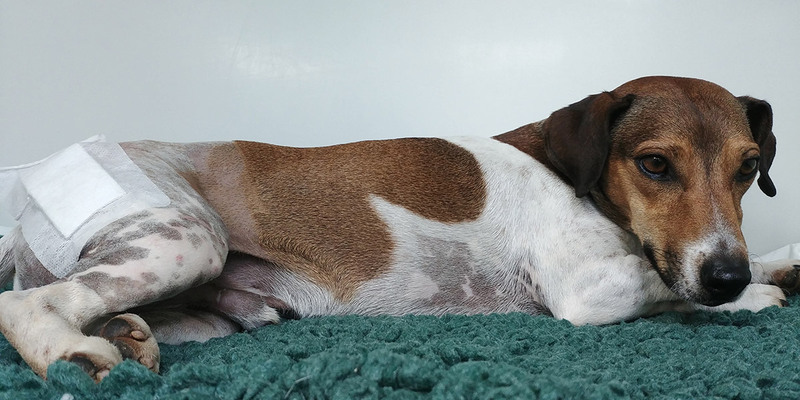 Our vet, Amy, anaesthetised Ted and X-Rays showed that he had dislocated his hip. This joint consists of a socket (acetabulum) in the pelvis into which fits a ball of bone (the head) which is connected by a strut (the neck) to the thigh bone (femur). The head is held in the acetabulum by a ligament and the joint capsule. Trauma to the hip can cause a fracture of the acetabulum, head or neck, or can tear the soft tissues resulting in a dislocation. In dogs and cats the dislocated head normally moves forwards and upwards. Whilst under anaesthetic the head was manipulated down and back into the acetabulum. If this had been successful the leg would have been placed in a sling. Unfortunately the head kept popping out, which happens in about two thirds of cases. The hip cannot be left dislocated as the head would be forced against the side of the pelvis causing discomfort and lameness. A surgical option was therefore required. One option is to incise down to the acetabulum, put the head back in and keep it in place with a false ligament, or a pin, and repair the joint capsule. This procedure has the benefit of restoring the normal anatomy but takes more time, needs a long recovery and can suffer complications. Another option in smaller dogs, and cats – which people often find bizzare – is the complete removal of the head and neck of the femur. As our patients stand on four legs the top of the femur that remains forms a false joint within the thick muscle over the pelvis. The result is usually very good leg function, with fewer complications and a quicker recovery. His owner opted for the second option. I operated on Ted on the day after Boxing Day. The neck of the femur was identified and an oblique cut was made with an oscillating saw. This removed the head and neck and left a smooth surface that could glide past the pelvis without discomfort. When the head was examined it was seen that a small fragment was missing from one side. This fragment was found to be still in the acetabulum and was removed. Ted recovered well and went home the following day. When he came in for stitch removal the site had healed well but he was still reluctant to put his foot down. Terriers are well known to keep holding a leg up when other breeds would be putting it down. His owner was shown how to flex and extend his leg before taking him out for slow walks. At a recent follow-up phone call it was pleasing to hear that he was making much better progress.